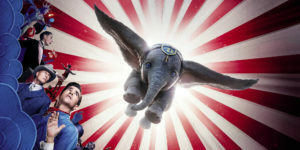 Though the 1941 original “Dumbo” movie is very short, 64 minutes, and full of racist innuendos, that darling flying, big-eared baby elephant is hard to resist—so it makes perfect sense that Disney place it on their ‘cartoon to ‘live action’ docket.’ The main hurdle in this remake has been overcome in that the CGI Dumbo looks adorable—it’s just too bad the little fellow has such a miserable life and that he’s actually not the star of his own film. Darling Dumbo takes a back seat to Michael Keaton, (Vandamere), the villain and dad, Collin Farrell (Holt), and he has about even screen-time with circus owner, Danny DeVito (Medici). The basic plot of Dumbo evolves as a conglomerate adventure park named “Dreamland” acquires a flying elephant act of a tiny circus. What I find odd is this plotline actually vilifies the concept of Dreamland, a place that easily resembles Disneyland. Dreamland also has a region named Nightmare—yes this is a Tim Burton film—although in reality a kid’s movie. This bizarre remake, full of missed script opportunities, “Dumbo” a children’s movie, has been given a dark theme, a painfully sad life, dull songs, scenes of torment, a creepy elephant handler with a whip, and two heart-wrenching scenes of separation from his mother. The new characters that are added as Dumbo’s family consist of Millie and Joe Farrier (Nico Parker and Finley Hobbins), along with single dad Holt, a French trapeze artist, Colette (Ava Green). As nurturing and caring they all are to Dumbo, further development of each is needed to know their emotions fully. Without depth, we are left without much heart to a film that should be full of heart. The scriptwriter Ehren Kruger wrote three “Transformer” films, “Revenge of the Fallen” (2009), “Dark of the Moon” (2011) and “Age of Extinction” (2014) those movies based on the Hasbro toys, have clearly gone into the realm of darkness, and away from children’s themes. Here, the film is based on the 1939 children’s story created by a Syracuse, New York couple, author Helen Aberson and the illustrator, (her husband), Harold Pearl, “Dumbo, the Flying Elephant.” Helen Aberson stated that the original premise is about a baby elephant born with very large ears, who must overcome adversity and ridicule to become a circus star. Note that both Aberson and Pearl are given novel credit. The adversity in the original story and film, are due to the challenges of having very large ears. Dumbo’s ears are so large that he steps on them and topples over; the circus crowd also teases him. When he does learn to fly, Dumbo has trouble controlling his speed and path, which leads to more problems. Author Aberson’s story ends with Dumbo becoming the main star of the circus, in the 2019 remake; Dumbo is the star, although his performances are always riddled with uncertainty. Given today’s filmmaking environment in developing quality movies for kids that serve as role models for parents or life lessons for kids, “Dumbo” 2019 doesn’t adhere to a standard that even comes close to a children’s film that I’d recommend for parents or kids to see. The best scenes are between Dumbo and the kids when they are teaching Dumbo to fly. In a decided script move, older sister Millie takes the lead, as she’s interested in science and experimentation, not performing. She’s wonderful in the scenes with Dumbo; I enjoyed her narrative although hearing only her side doesn’t help character development with Dumbo. I would have appreciated hearing what he had to say about his unusual situation. Dark in tone throughout; Dumbo is unnecessarily separated from his mother a second time, and the storyline is such that his mother will purposely be killed, here’s the line from the film that’s spoken to Holt, his children and Medici’s troupe, “Mrs. Jumbo will be gone by tomorrow night, and she’s not meant to survive.” Why is this storyline in the film; to create fear, to create panic, to create sorrow or to persuade a Dreamland worker to turn on the villain? Mrs. Jumbo’s impending death has no place in a film that should be centered on finding perseverance and strength to overcome adversity. Another misstep is placing the kids in a darkly lit situation for the last half an hour, with a night setting—the circus tent begins to burn, the electricity is shut off, and the ‘Dreamland’ or the weird facsimile of Disneyland begins to go dark. The kids, Millie and Joe, are trapped with their father Holt in a circus tent with flames surrounding them. Disney should be held accountable, what a travesty and a missed opportunity for the children of the world. So sad, it’s time to stop making downer movies and to give kids something to hold on to—give them positive examples of hope or at least teach them something valuable.